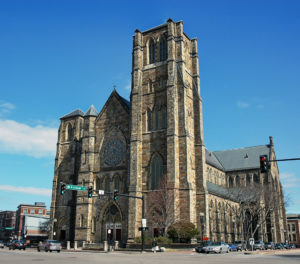 The Cathedral of the Holy Cross in Boston is the mother church of the Metropolitan See of Boston and the seat of His Eminence, Seán Patrick Cardinal O’Malley, the Archbishop of Boston. Located in the South End neighborhood of the City of Boston, the Cathedral serves a vibrant, diverse community worshiping English, Spanish, German, Ge’ez and Tridentine forms of the Catholic Tradition. Designed by the nineteenth century Irish-American ecclesiastical architect Patrick Keely, the Cathedral of the Holy Cross measures 364 feet in length, 90 feet in width and 120 feet in height. In 1860, Bishop John Fitzpatrick began work on a new Cathedral realizing that the Catholic population outgrew its first cathedral on Franklin Street. 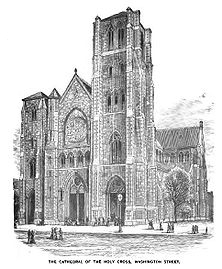 After the American Civil War stalled the project, the then diocese of Boston finally broke ground on 29 April 1866. Archbishop John J. Williams, the first archbishop of Boston, presided at the rite of dedication on the Solemnity of the Immaculate Conception of Mary, the Mother of God, 8 December 1875. As the largest Church in New England, the Cathedral seats nearly 2,000 people. Its Gothic Revival style incorporates local Roxbury puddingstone and gray limestone. The Cathedral houses the largest, and arguably finest, organ built by the world-renowned Hook and Hastings Company in 1875. As the Mother Church of the Metropolitan See of Boston, we welcome people from around the world to worship with us. The Church is open daily for personal prayer between 9:00 am and 6:00 pm. Please come to worship with us on the ordination day and all during your stay.